We kicked off our Christmas Season on Thanksgiving night by watching Elf. When he went through the seven layers of the candy cane forest, I knew that we would be making a candy cane forest this year. We began by making little x's in the gift box with the box cutter~~obviously, this is an adult job. Put together the lid to the shirt box by taping the corners. 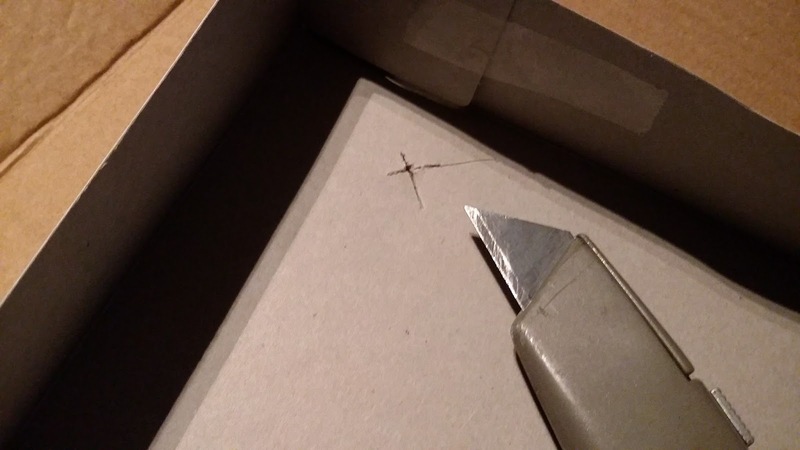 Place on top of a thick piece of cardboard and make your x marks. I was thinking about the size of the x's on takeout drink lids that a straw would go through. You don't want them to be too big or the candy canes won't stand. 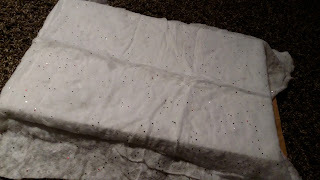 Flip your lid over and put a layer of the glitter snow blanket. Cut it to fit the box so that you can tape it underneath. You should be able to feel where your x's are. You might need to use the box cutter to make a tiny slit in the snow fabric. Poke the candy canes through. 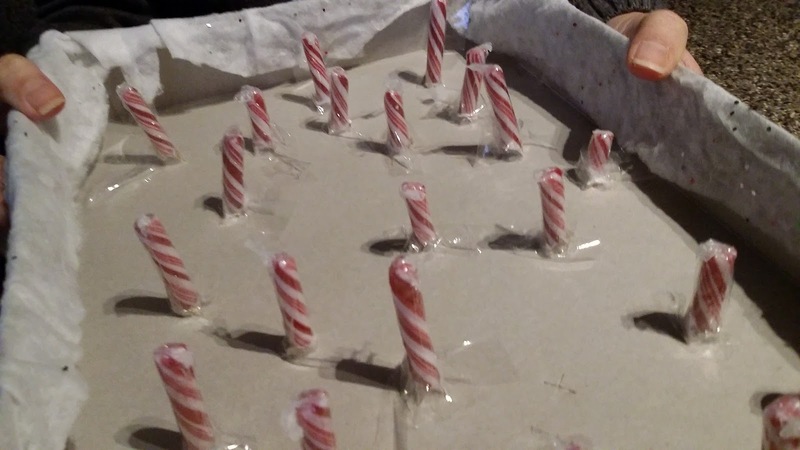 Once all of your candy canes are in, flip the lid over carefully. 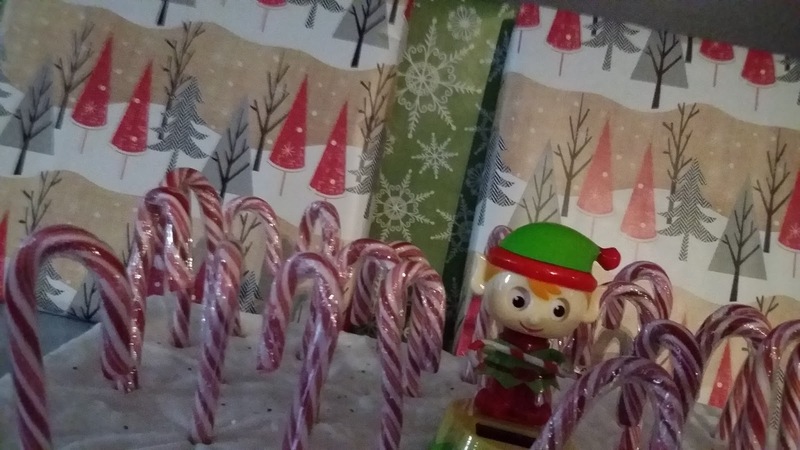 Tape the candy canes underneath the lid so that they stand better. This would probably work really well if you have a piece of Styrofoam that's about 1 inch thick instead of the gift box, but we didn't have anything like that in our house and I didn't see anything at the dollar store. I figured I could make a gift box work. 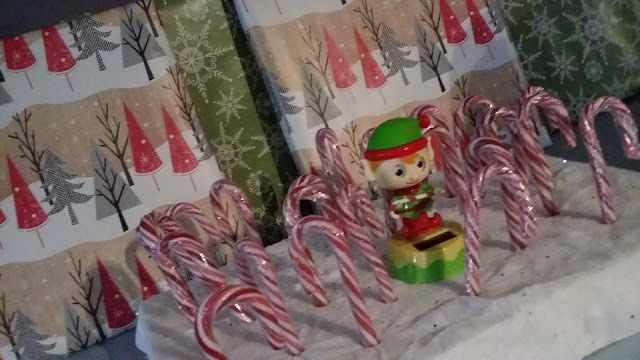 Once all of your candy canes are secure, flip the box lid back over. Put your elf figurine where you want him and Voila! You have your Candy Cane forest. We've seen a lot of people riding around with Christmas trees on top of their car in the last several days!! Have you started decorating yet?